The GPRSbee is a GPRS/GSM expansion board. The GPRSbee uses SIM cards of the MicroSIM form factor. The core of this board is the well known SIM900 module. This module, like most other GPRS/GSM modules, has an operating voltage of 3.5 – 4.5 volt and can draw up to 2A power during broadcasts bursts. This makes the 3.3V power that the bee socket can provide unsuitable. 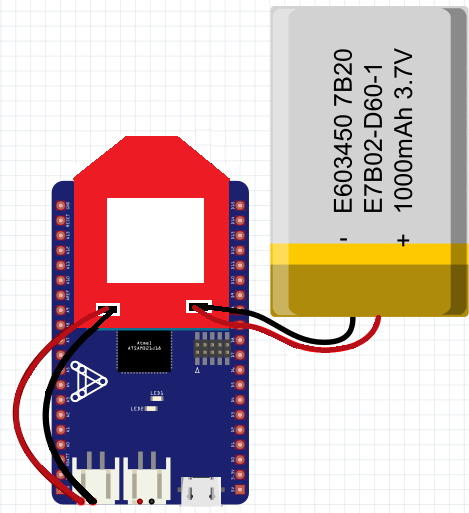 This has been solved by powering the GPRSbee directly from a 3.7 volt LiPo battery. To supply a sufficient amount power supply to the GPRSbee , a LiPo 3.7 volt battery has to be connected to one of the two JST connectors. The other JST connector can be used to power the main board with the supplied jumper cable. The GPRSbee uses DTR pin (pin 9) for software ON/OFF. Switching on is simply a matter of setting DTR pin to high. The CTS pin (pin 12) is used for power status.. If the CTS pin is high the GPRSbee is on, if it is low it’s off. 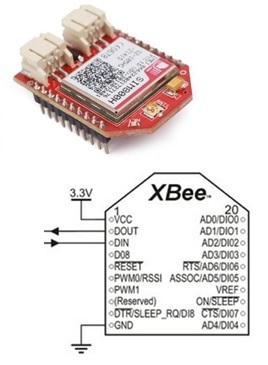 GPRSBee has 2 JST power connectors, connect one of them to a 3.7 LIPO battery and the other JST to the LIPO JST of the Autonomo. * Copyright (c) 2016 SODAQ. //                to a predefined Mobile number with a predefined message.